Wheelersburg’s Abbie Kallner hit two humongous 3-point field goals late in Monday’s contest, but it wasn’t enough in a one-point loss to Oak Hill on the road. OAK HILL — Abbie Kallner gave it her best shot … or shots if we’re being literal. 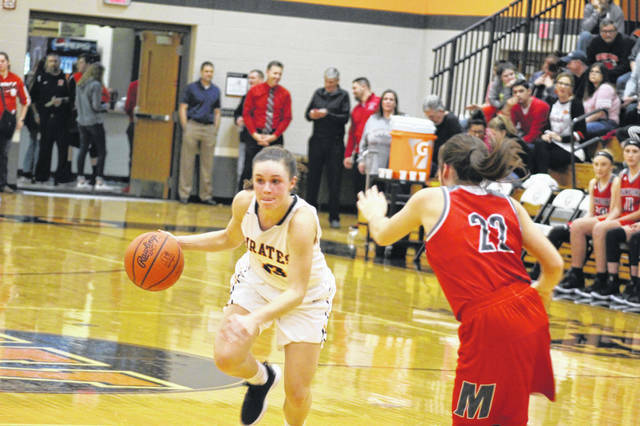 With Wheelersburg trailing Oak Hill 38-32 with less than three minutes left in regulation Monday night, the Pirates’ senior guard cut the deficit to three with a 3-point field goal from the top of the key. And after the Oaks responded by hitting one of two free throw tries on the other end, Kallner dialed downtown again, cutting Oak Hill’s edge to just one at 39-38. But unfortunately for Kallner and the Pirates, that’s the last bucket they saw fall. Still trailing 39-38 with 4.1 seconds left, Wheelersburg had one last chance at stealing a win but with Kallner double-teamed in the corner, the Oaks’ defense got a final needed stop en route to a one-point Southern Ohio Conference II victory on their home court. Tuesday’s loss marked the second in three tries for the Pirates (1-2, 1-1 SOC II) this season. Wheelersburg started with a 41-35 win over Minford in conference play, but have followed it with a 52-50 loss to Alexander and Monday’s loss to the Oaks. Having said that, Minford, Alexander and Oak Hill is quite the tough start to any schedule. But Spradlin isn’t making excuses. Still, two early season losses aren’t going to make or break a team. In fact, they may help the Pirates as the year rolls along. Monday’s matchup pitted two completely different teams against one another in terms of scheme. While Wheelersburg — playing with a smaller lineup — continued to settle for jump shots, Oak Hill (2-0, 1-0 SOC II) used its size and strength to score in the paint. Junior guard Caitlyn Brisker made a living by scoring off the dribble-drive while teammate Chloe Chambers, a freshman, used her 6-foot frame to cause havoc under the bucket. Those two combined to score 25 points and bring down 14 rebounds. Overall, the Oaks hit just one 3-point field goal while shooting 15-of-29 inside the arc. Kallner led the Pirates with 15 points while freshman Alaina Keeney put together a nicely rounded performance with 13 points, seven rebounds and four assists. Ellie Kallner also chipped in, scoring seven points and grabbing four boards. Brisker matched Kallner’s 15 points for Oak Hill alongside six rebounds and three assists. Chambers followed with 10 points and eight boards while Payton Crabtree also reached double-digit scoring figures with 10 points of her own. The Pirates will try and bounce back Thursday, hosting Northwest in SOC II play. That comes before Saturday’s home date with Chesapeake. “We’ll look at some film and, once we get a chance to practice, show the girls some of the things we’re talking about,” Spradlin said. “It’s a busy week. Wheelersburg: 15-44 FG, 1-2 FT, 7-22 3pt. (A. Kallner 3, Keeney 3), 19 rebounds (Keeney 7), 10 turnovers, 9 assists (Keeney 4). Scoring: A. Kallner 15, Keeney 13, E. Kallner 7, Darnell 3. Oak Hill: 16-33 FG, 6-9 FT, 1-4 3pt. (Brisker 1), 22 rebounds (Chambers 8), 13 turnovers, 9 assists (Brisker 3, Miller 3). Scoring: Brisker 15, Chambers 10, Crabtree 10, Clarkson 4.